Last Updated: April 17, 2019 | Subscribe to our weekly newsletter! When you think about keeping a pool clean and sanitized, the first thing that pops into your head is probably chlorine. Of course it is. Chlorine is the most common chemical used to sanitize pools. Even salt water pools use chlorine; it’s just generated from salt. But maybe you’ve been thinking about switching to a different sanitizer. Chlorine can be harsh on the hair, skin, and eyes. When it starts to diminish, it can produce chloramines, which are what give off that telltale pool smell. And you might even have a sensitivity to it that can exacerbate certain conditions. If you’re on the lookout for an alternative sanitizer, consider the pros and cons of Baquacil® before you make a decision. It’s a brand name for the chemical preservative-free polyhexamethylene biguanide, better known as PHMB, also known as biguanide. It’s a chlorine-free sanitizer If you click this link and make a purchase, we earn a commission at no additional cost to you. . It was originally developed as a surgical disinfectant. It’s actually similar to hydrogen peroxide. Then, in 1977, a method for using biguanide to control bacteria and algae in pool water was patented, and companies began using it to manufacture pool chemicals. In addition to Baquacil® you’ll find other biguanide brands available including SoftSwim If you click this link and make a purchase, we earn a commission at no additional cost to you. , Revacil, Aqua Silk If you click this link and make a purchase, we earn a commission at no additional cost to you. , and Splashes. 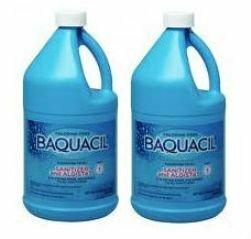 But Baquacil® seems to be the most commonly used of those brands, and has the widest selection of products to go along with the sanitizer. This includes everything from test strips If you click this link and make a purchase, we earn a commission at no additional cost to you. , to pH decreaser If you click this link and make a purchase, we earn a commission at no additional cost to you. 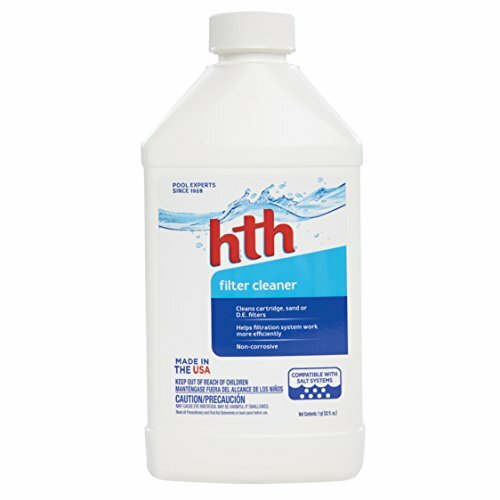 , to filter cleaner If you click this link and make a purchase, we earn a commission at no additional cost to you. , and much more. 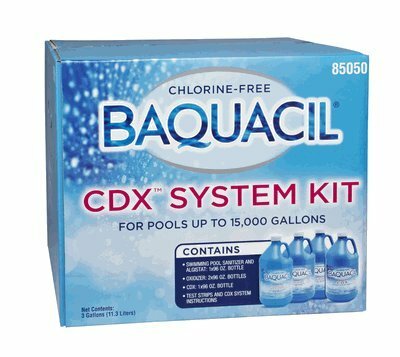 Note: If use Baquacil® instead of chlorine, you must use Baquacil® oxidizers If you click this link and make a purchase, we earn a commission at no additional cost to you. and algaecides If you click this link and make a purchase, we earn a commission at no additional cost to you. . They’re created to work specifically with the sanitizer. You can, however, use other brand of chemicals to balance pH, alkalinity, and calcium. The key ingredient is the biguanide, which causes contaminants in pool water to bind together in water-insoluble clumps. This makes it easier for the pool filter to capture them. The downside is this also clogs the filter more quickly and more often than other sanitizers. It’s not a huge deal, really. It just means you’ll have to clean your filter If you click this link and make a purchase, we earn a commission at no additional cost to you. more often. This bit of extra work is a tradeoff for some of the benefits you’ll gain from using Baquacil. If you’re not quite sure whether and why you may want to switch from chlorine to Baquacil®, consider the positive effects it can have on your pool and your body. Let’s dispel a myth real quick—there’s no such thing as a chlorine allergy. But you can be sensitive to it, and this sensitivity can lead to chlorine rash or even hives. This is called irritant dermatitis, and it’s similar to a chemical burn, though not nearly as severe. Chlorine can also cause respiratory difficulties if you already have a condition such as asthma, as well as dry out your skin, hair, and nails, and irritate existing dermatitis. It can also aggravate other skin conditions such as rosacea and eczema, though some people with eczema actually find chlorine soothing to their skin. Baquacil® has none of these effects. Aside from chlorine itself being a potential irritant, a chlorine byproduct called chloramines can also cause irritation and respiratory distress. Chloramines are created when chlorine in pool water comes into contact with organic substances like sweat and urine, which contain ammonia. A chemical reaction occurs as the chlorine works to rid the water of these substances. As a result, chloramines are created and rise out of the water, which means chlorine levels drop. Chloramines are actually what you smell when you go to a public pool. It’s an indication there’s not enough chlorine in the water, so think twice before you jump in. 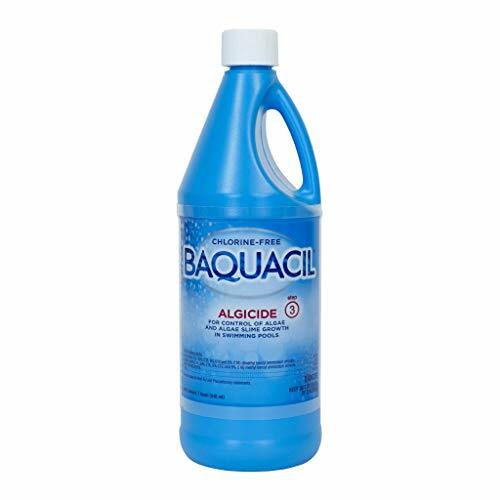 Because Baquacil® doesn’t contain any chlorine, it’s not possible for it to produce chloramines. No smell, and no eye and lung irritation. One of the reasons you need to stay on top chlorine levels is that sunlight—specifically, ultraviolet light—degrades chlorine, requiring you to add it frequently to keep levels stable. Biguanide doesn’t degrade in sunlight, or because of changes in temperature and pH levels, which can also reduce chlorine levels. Have you ever gone swimming and noticed your blond hair turned green from the pool? You know why that happens? Yup, you guessed it—chlorine. Well, actually, it’s because of copper in the water, but only if that copper is oxidized by chlorine. Biguanide doesn’t oxidize metals. So if your water source contains copper, you can swim without fear of your hair turning green. Unless, of course, that’s the look you’re going for. Just like anything else, Baquacil®has cons to go along with the pros. Baquacil®and other biguanide-based pool chemicals usually cost more than chlorine. And remember, you’ll need an extra oxidizer, and you can only use algaecide made for biguanide sanitizer. You’ll really have to weigh this one against the benefits. Bacteria and algae? Absolutely. Biguanide is on the job. Sweat, body oil, urine, and, uh, other body waste? Sadly, no. Biguanide isn’t an oxidizer, which is the process that tackles those specific contaminants. You’ll have to add the Baquacil® Oxidizer If you click this link and make a purchase, we earn a commission at no additional cost to you. . But it means an added expense as well as an added step in your pool care. Just as can happen when you use antibacterial soap in your home, some microorganisms can become resistant to Baquacil® after you’ve been using it for a while. You won’t know this is happening because there’s no indication. You’ll just be swimming with bacteria and other invisible, nasty things floating in the water. It’s a sanitizer, not a pool clarifier. Cloudy water is a common side effect of biguanide. This is because when biguanide clumps together all those tiny contaminant particles, and those clumps get stuck in the pool filter, the filter can’t work as efficiently or effectively as it should. The result is cloudy water. 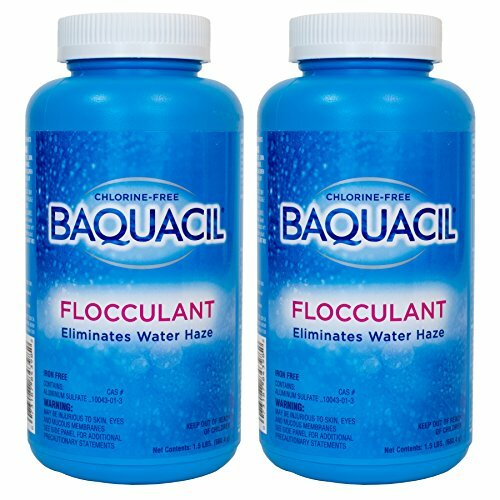 The good thing is, the Baquacil® manufacturer also makes a flocculant to clear water haze If you click this link and make a purchase, we earn a commission at no additional cost to you. .
And while this may be a bit of a hassle, it’s easily remedied by regularly cleaning the filter If you click this link and make a purchase, we earn a commission at no additional cost to you. .
Just like with other pool chemicals, you’re shooting for specific levels when you sanitize with Baquacil®. You’ll also have a couple of additional chemical needs. 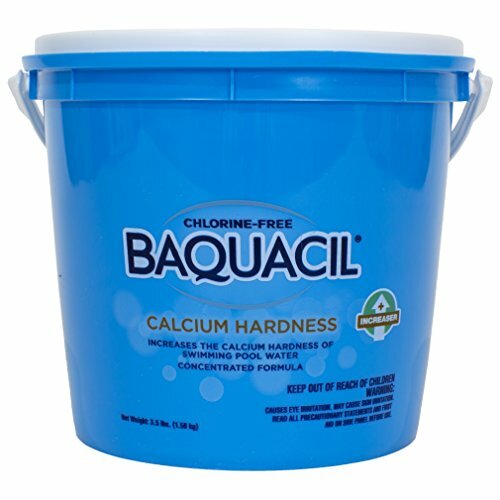 In order to keep your pool water clean, keep the Baquacil® levels between 40 parts per million (ppm) and 50 ppm. Never allow it to drop below 30 ppm. 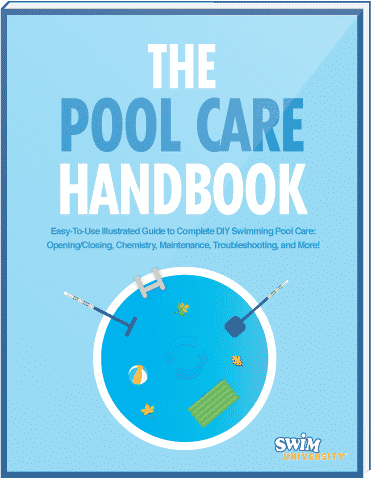 The amount of acidity in your pool water is indicated by pH. The ideal range for that is between 7.4 and 7.6. The pH levels will be most affected by the Baquacil® sanitizer, so remember to test pH levels every time you add more sanitizer. Working as a buffer, alkalinity helps keep pH levels from drastically spiking or dropping every time changes occur in the water, whether it’s more chemicals being added or just rainfall. To be most effective, alkality levels should fall between 100 ppm and 150 ppm. If alkalinity falls below 100 ppm, the pH levels may rise or fall dramatically. If alkalinity rises above 150 ppm, your pool water may become cloudy and scale may form, which will cause pH levels to drop. To keep things right where you need them, stock up on alkalinity increaser If you click this link and make a purchase, we earn a commission at no additional cost to you. . In a pinch, you can also add sodium bicarbonate to the water to raise alkalinity. To lower alkalinity, simply add pH decreaser If you click this link and make a purchase, we earn a commission at no additional cost to you. . You can also use muriatic acid If you click this link and make a purchase, we earn a commission at no additional cost to you. . Or you can just wait for the levels to drop on their own. It’s much more likely you’ll have low alkalinity, but it’s good to know how to handle a high level if it happens. While you don’t want too much calcium in your tap water, you do need a certain amount of it in your pool water. Calcium hardness indicates how hard or soft your pool water is, which is a result of how much calcium is dissolved in it. Too high, and you’ll likely end up with a cloudy pool on your hands. Too low, and the water can actually start eating away at metal and even the concrete in and around your pool. The ideal range to shoot for is between 175 ppm and 275 ppm. Remove some of the pool water and replace it with softer water. If you’re using tap water, use a hose filter If you click this link and make a purchase, we earn a commission at no additional cost to you. to keep as much calcium out of the pool as possible. Use a flocculant If you click this link and make a purchase, we earn a commission at no additional cost to you. to clump some of the calcium, and then vaccum it out. 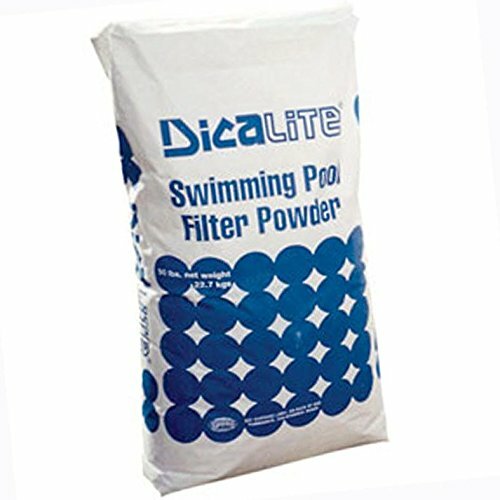 Afterward, be sure to backwash your filter and scrub your pool’s walls and floor to remove calcium deposits. Add muriatic acid If you click this link and make a purchase, we earn a commission at no additional cost to you. to the water. This won’t reduce calcium hardness. Instead, it increases the water’s saturation level, which can balance the water. Simply add calcium hardness increaser If you click this link and make a purchase, we earn a commission at no additional cost to you. . Continue adding and testing until the level reaches the goal range. Because Baquacil® doesn’t oxidize contaminants the way chlorine does, you’ll need to add an oxidizer to address things like sweat, body oils, shampoos, makeup, etc. An oxidizer will also help boost the sanitizer’s fighting power against algae. Important: Remember that you must use an oxidizer meant to work with a biguanide sanitizer. The best defense against algae is keeping sanitizer levels steady. 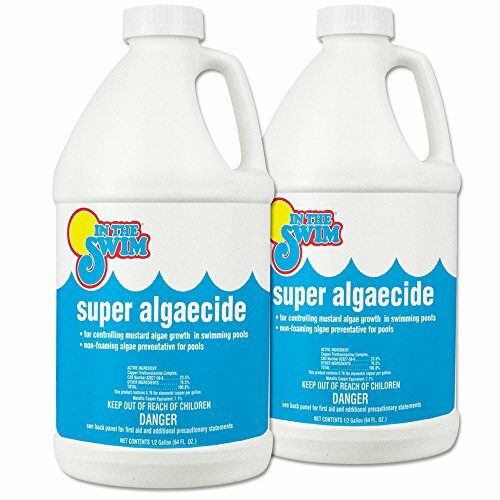 But because a biguanide sanitizer doesn’t oxidize, which is the process that helps it fight off algae, you’ll also want to keep an algaecide on hand. Important: Remember that you must use an algaecide meant to work with a biguanide sanitizer If you click this link and make a purchase, we earn a commission at no additional cost to you. . The best time to make this switch is in the spring when you open your pool. You’ll want to start with a clean filter that ideally doesn’t have any chlorine residue in it. Cartridge Filter: A simple rinse with water won’t be enough, nor will a spray filter cleaner. 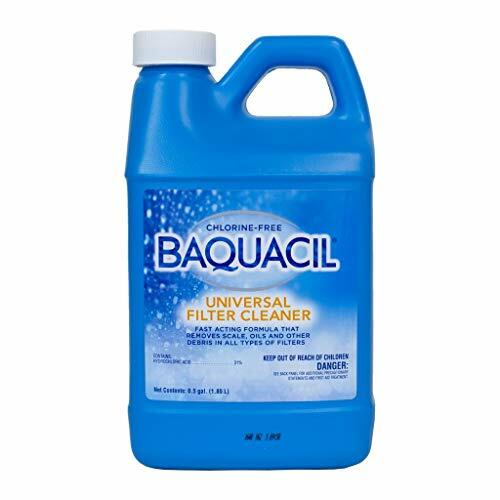 Use the Baquacil® Universal Filter Cleaner If you click this link and make a purchase, we earn a commission at no additional cost to you. to thoroughly clean the cartridge. Your best bet is to replace the cartridge If you click this link and make a purchase, we earn a commission at no additional cost to you. altogether. This way, you’re starting fresh with absolutely no chlorine in the filter. Diatomaceous Earth (D.E.) Filter: Take out the filter grids, remove the D.E. 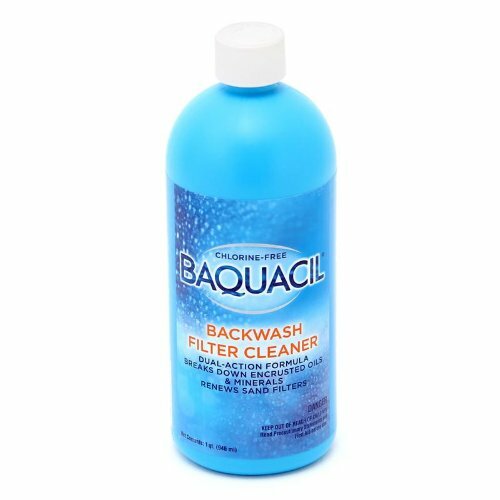 powder from them, and use the Baquacil® Universal Filter Cleaner If you click this link and make a purchase, we earn a commission at no additional cost to you. to thoroughly clean the grids. Also clean out the tank taking care to remove all the D.E. powder from every surface. When everything’s clean, add new D.E. powder If you click this link and make a purchase, we earn a commission at no additional cost to you. , and reassemble the filter. Sand Filter: You could clean the sand, but we highly recommend removing it all instead. 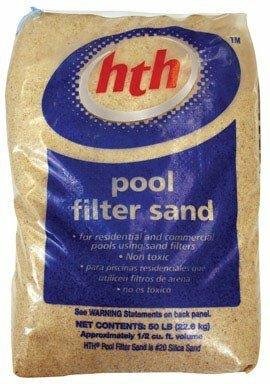 It will be just about impossible for any filter cleaner to completely remove all the chlorine from every grain of sand. Once you’ve removed the sand, thoroughly clean the tank. Add new sand If you click this link and make a purchase, we earn a commission at no additional cost to you. , and reassemble the filter. 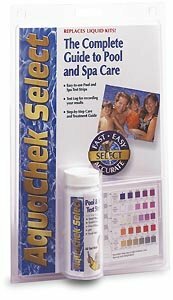 For this conversion, it’s best to Take a sample of your pool water to an authorized Baquacil® dealer for a thorough analysis. 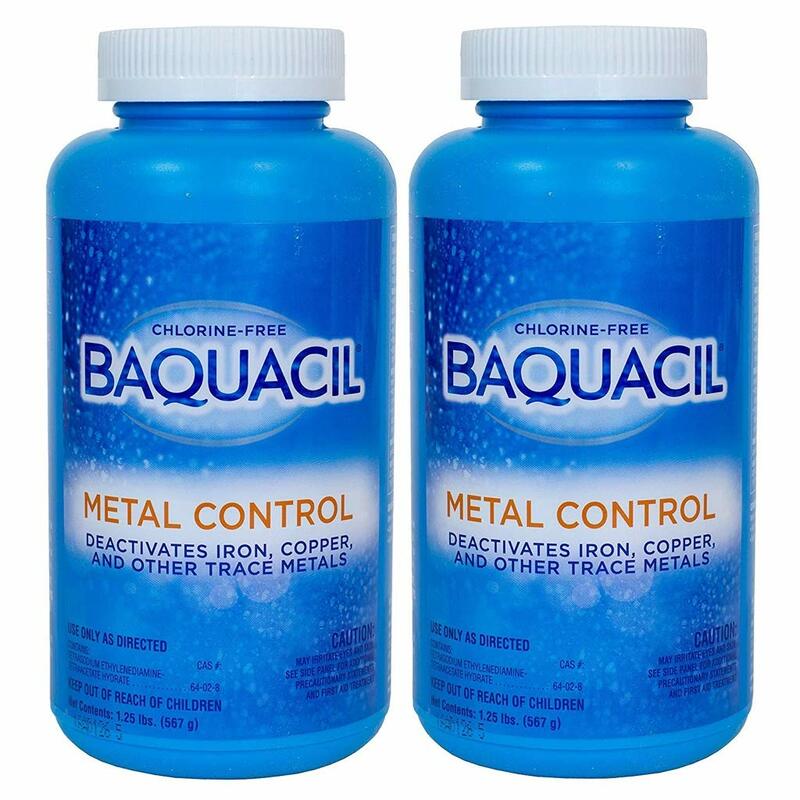 If the analysis reveals that your pool water contains any kind of metal, add Baquacil® Metal Control If you click this link and make a purchase, we earn a commission at no additional cost to you. . Use one entire bottle for every 2 ppm of metals and every 10,000 gallons of water. Run the pump continuously to circulate the water for 8 to 12 hours. 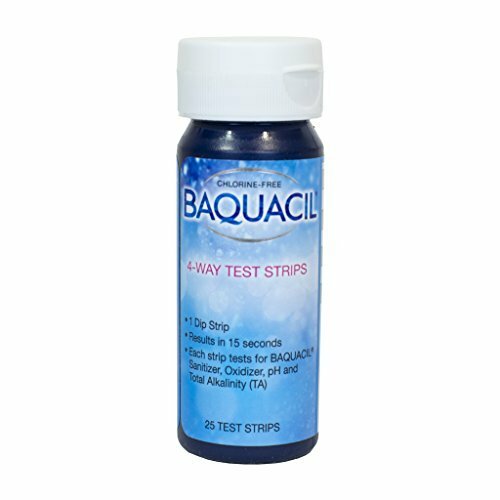 To acheive the necessary 50 ppm level, add one half gallon of Baquacil® Sanitizer and Algistat If you click this link and make a purchase, we earn a commission at no additional cost to you. for every 10,000 gallons of pool water. Test to make sure that level has been reached. If not, add another half gallon, then test again, repeating this process until the water contains 50 ppm of sanitizer. Remember, this is essential to protecting your pool from all contaminants. The Baquacil® sanitizer can’t do it alone. 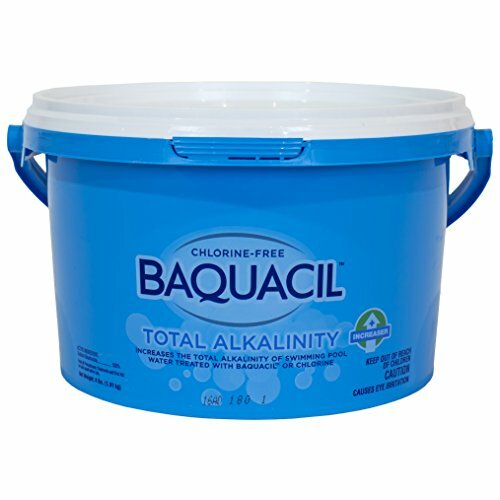 Add one gallon of Baquacil® Oxidizer If you click this link and make a purchase, we earn a commission at no additional cost to you. for every 10,000 gallons of pool water. This product works with the sanitizer and oxidizer to target kill and prevent pink slime and white water mold. 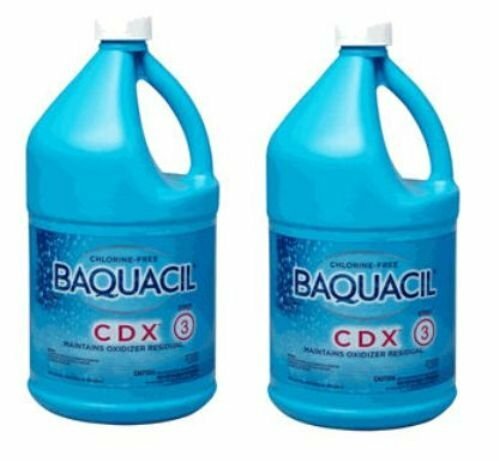 Add 1 pint of Baquacil® CDX If you click this link and make a purchase, we earn a commission at no additional cost to you. for every 10,000 gallons of pool water. Say goodbye to dry skin, stinging eyes, and green hair. All that’s left to do now is routine maintenance to keep all the chemical levels where they need to be. If you’re already using Baquacil®and want to go back to chlorine, you can switch back. The best time to do this is also in the spring when you open your pool. Keep testing the water until all levels drop to zero. If you’re worried about algae invading while you’re doing this, you can add a non-biguanide-based algaecide If you click this link and make a purchase, we earn a commission at no additional cost to you. and brush the walls regularly to keep the pool as clean as possible while you wait for the levels to go down. Biguanide chemicals can build up inside your filtration system. To make sure they’re completely gone before you start taking your pool back to chlorine, give the filter a thorough cleaning. 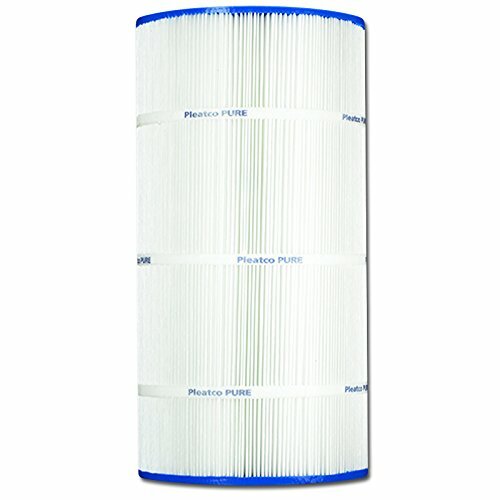 Cartridge Filter: A simple rinse with water won’t be enough, nor will a spray filter cleaner. Soak it in a chemical rinse If you click this link and make a purchase, we earn a commission at no additional cost to you. according to the package directions. This will usually be overnight. Your best bet is to replace the cartridge If you click this link and make a purchase, we earn a commission at no additional cost to you. altogether. This way, you’re starting fresh with absolutely no biguanide in the filter. D.E. Filter: Take out the filter grids, remove the D.E. powder from them, and soak them in a chemical rinse If you click this link and make a purchase, we earn a commission at no additional cost to you. overnight. While they’re soaking, clean out the tank taking care to remove all the D.E. powder from every surface. When everything’s clean, add new D.E. powder If you click this link and make a purchase, we earn a commission at no additional cost to you. and reassemble the filter. Sand Filter: You could clean the sand, but we highly recommend removing it all instead. It will be just about impossible for any filter cleaner to completely remove all the biguanide from every grain of sand. Regardless of what kind of sanitizer you’re using, remember to always adjust alkalinity before pH. Increase or decrease alkalinity as necessary to get it into that 100 ppm to 150 ppm range. Once you have the alkalinity where you need it, it’s possible the pH will be low. Add pH increaser to get the level to the 7.4 to 7.6 range. Note: If both the alkalinity and pH are low, try adding alkalinity increaser, then test the water If you click this link and make a purchase, we earn a commission at no additional cost to you. before adjusting the pH. It may increase both levels. 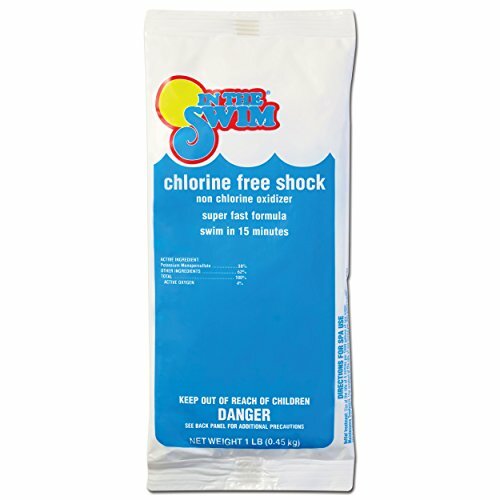 Add 4 pounds of non-chlorine shock per 10,000 gallons of water. For example, if your pool holds 20,000 gallons, you’ll add 8 pounds of shock. Run the filter continuously for 48 hours. Important: Use only non-chlorine shock If you click this link and make a purchase, we earn a commission at no additional cost to you. for this step. Do not use any other type of shock. Note: The water may turn clear green. This is normal, and should abate when the transition process is complete. After 48 hours, check the pH level again, and adjust it if necessary. Don’t rush this step. You’re reintroducing chlorine after having used a non-chlorine sanitizer, so go slowly. 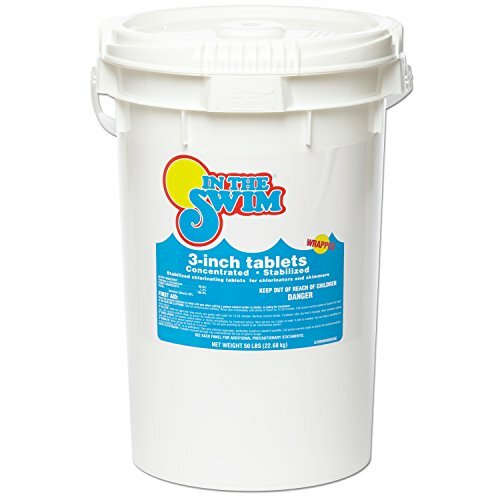 Start by adding one 3-inch chlorine tablet If you click this link and make a purchase, we earn a commission at no additional cost to you. into your skimmer or chlorinator until it completely dissolves. Next, add two chlorine tablets, and let them completely dissolve as well. Continue this process, increasing the tablet count by one each time, until the water reaches a chlorine level of 1 ppm. Once you’ve hit that mark, test the water one more time to make sure all chemical levels are where they need to be. Adjust as necessary, and then you can continue on a chlorine pool maintenance schedule. Tired of feeling like sandpaper after every swim? You might be ready to give Baquacil® a try. Just remember you’ll be taking on some added expense, and a little extra work. But you may find those to be acceptable tradeoffs. And if it doesn’t work out, no worries! You can always switch back to chlorine. It’ll also require some extra effort, but it’s not impossible. Whatever sanitizing system you choose, the most important thing is that you and your family enjoy your pool. Pink slime and white water mold are commonly misunderstood in the swimming pool world, but we are going to clear some things up in this tutorial.